It is hard to believe that an island as small as Singapore is home to 14 private golf clubs and 3 public golf courses although this is about to change as the government intends to terminate the leases of several clubs to make way for building projects. 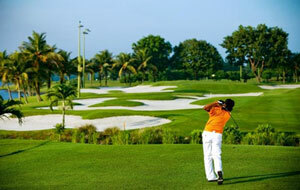 We are one of the few companies that have discount green fees at the golf courses in Singapore. Generally the quality of golf on offer in Singapore is outstanding with several world-class courses most notably the 36-hole Sentosa Golf Club with its outstanding Serapong Course which hosts the annual Singapore Open which attracts top golfers from all around the world. 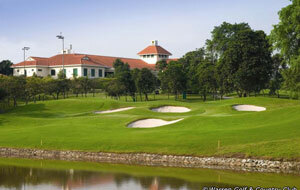 Read about the best golf courses in Singapore. Despite a valiant attempt to give it a Scottish feeling the Master Course at Laguna National Golf & Country Club this a classic parkland courses with four huge lakes dominating the course and coming into play on 12 of the holes. Its sister course the Classic Course which was totally re-designed by Andy Dye remains one of the most difficult courses to be found anywhere with one par 3 measuring more than 300 yards from the back tees. The most exclusive golf course in Singapore is the Singapore island Country Club which boasts four different layouts plus a nine-hole Executive Course. The Bukit Course is laid out beside MacRitchie Reservoir, and is home to numerous mature trees of many varieties. This championship course has also hosted many international events. Winding its way through old trees, the Island Course is extremely pretty but there are lots of slopes and inclines. If you have time you might like to take on the challenge of SICC’s New Course which is generally considered to be the most difficult course as it meanders through the natural rainforest. Warren Golf & Country Club has a history dating back to the early 60’s and started out life as a 4-hole layout which was later expanded to 9-holes, A few years ago it was forced to re-locate and now offers an 18-hole championship golf course together with extensive of social and other leisure facilities. Keppel Golf Club which was originally designed by Ronald Fream and later changed by Chris Pitman is one of the courses slated to close when its lease expires. Very close to the centre of the city it’s hard to believe that they have manged to fit 18 holes on such a small plot. 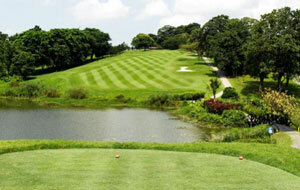 One of the top clubs in Asia, Tanah Merah Country club with its two 18-hole layouts – Garden Course and Tampines course has consistently been recognised and has hosted several prestigious events including the HSBC Women’s Championship. Situated amidst 140 hectares of beautifully landscaped countryside Raffles Country Club offers great views across the peaceful lake and the hills behind it. It has two 18-hole golf courses: the Lake Course and the Palm Course, both of which have enough challenges for golfers of all standards. Golfsavers have excellent rates at most of the golf courses in Singapore and we can help you to book a tee time using our simple online booking engine.